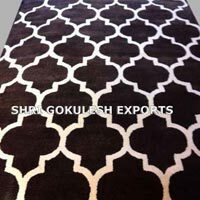 We specialize in making custom made carpet in any pattern, shape, size and colour combination in short delivery period. Primarily, this service is given in the handtufted carpet, but is also available in all other techniques. Being a traditional artisans family helps, even when looking beyond the regular area of ones craftsmanship. Having been in carving and inlay crafts for many generations and exporting them to world over for about 30 years, we gradually branched out into weaving. We were soon noticed by our world clients, because of our outstanding treatment of the craft.